Tokyo's world-famous Akihabara district lost one of its signature stores on Saturday, and with it a piece of the area's rich electronics history faded away. The Radio Store, one of the landmarks that gave Akihabara it's 'Electric Town' nickname, closed its doors for the last time on Saturday evening after 64 years in business. The store got its start in the years after World War II as the country's post war electronics market boomed and companies like Sony were launching their first products. Electronics wholesalers and black-market vendors opened stores in the area bringing it a reputation as the go-to place for electrical goods and components. The mass of street vendors was discouraged by the Allied GHQ that administrated Japan after the war and an area under Akihabara's railway tracks was made available for them to set up shop. As the electronics industry grew, newer buildings were needed to house the increasing number of stalls selling components. On March 8, 1950, The Radio Store building opened. It was the first such electronics superstore, built by ten of the prominent vendors at the time, and housed their stores and eventually hundreds of others. It and stores like it have become one of the landmarks that gave Akihabara it's 'Electric Town' nickname. On Saturday, Nov 30, 2013 that landmark closed it's doors for the last time. 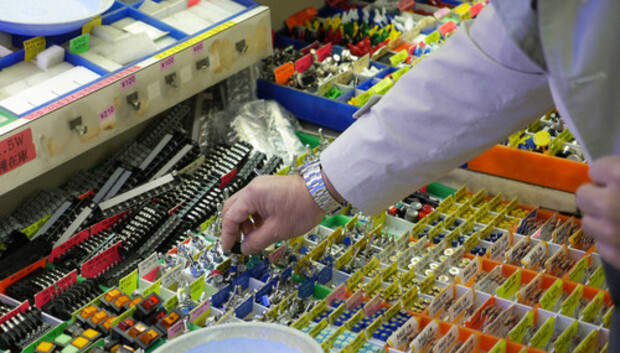 For stores like Fukei Electrical, the closure is not the end on business. As one of the private companies that founded the Radio Store building, the company used its profits to form the Tominaga Electrical Corp. that now manufactures and supplies high tech components to larger corporations, trading companies and electronics retailers like the one they started in Akihabara. "I am happy to have worked here. It was good to be a part of the history of Akihabara. Stores like this one were what got me interested in electronics," said Mr. Kano, the manager of the Fukuei Electrical booth in the Radio Store. Mizutani Store sold Heat-sinks, connectors and nuts and bolts, and will be closing down for good. "I honestly haven't really thought about it," said store manager Mr. Kodama, who appeared too busy to come to terms with its closure. "It's a bit sad, but I am more worried about how I'm going to pack all of this up ... I think I will only realize it's closed next week when I don't have to come to work." On hearing about the closure, Mr. Mae, a 76 year old retired engineer and amateur radio operator traveled 500 kilometers from Fukui Prefecture in western Japan to reminisce. When he was 16, he used what savings he had to go to Tokyo he built his first radio receiver from components he bought at the Radio Store. He has been an enthusiast ever since. "When I came to Tokyo for university I was here every day," he said. "We could talk to the clerks and other radio fans about the latest technology developments and we would all always be saving for next new component. I moved on from receivers to amateur radio operation, so naturally I built my own transmitter. It opened me up to the world." He remembered how the Radio Store's success led to the building of the nearby "Radio Center" and from there more buildings started to pop up housing similar component vendors. "It was always busy," he said. "It would take a few hours to move around and wait in line to shop at the popular vendors. Often the best components would get sold out very quickly." The Radio Store building will be sold to the East Japan Railway Company that operates Akihabara Station. There have been no announcements as to what the building or land will be used for in the future. The closing of the Radio Store signals the end of an era for Akihabara. While neighboring buildings and the component vendors therein will continue, the steady decline in customers in this now niche market could see more of these iconic Akihabara landmarks following suite.